In the late 40s, when UNICEF was established, unlike other UN organizations funded with compulsory contributions from member states, the Fund received just voluntary donations from people and governments. The first design for the cards, shown below, was a picture of a maypole painted on glass by a seven-year-old Czechoslovakian girl Jitka Samkova. 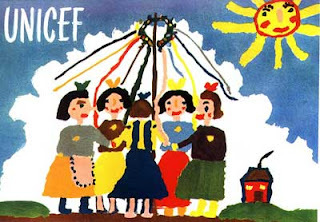 Jitka and her classmates were regular drinkers of Unicef milk, and the paintings they produced were a 'thank-you', sent off to UNICEF's bureau in Prague by their teacher. The picture from Prague was sent to the office in Vienna directed by Al Davidson, who asked Grace Holmes Barbey, Executive Director Assistant in an information mission in Europe, to bring the painting, first to Paris and then to the HQ in New York. Once arrived in New York, Ms Barbey in collaboration with Gil Redfern, Helen Matousek and Mrs Edwards and with the support of the Executive Director decided to publish a small amount of greeting cards based on the May pole painting to fund a small project (excerpt from an interview of Ms Holmes Barbey). Nowadays, UNICEF greetings and Christmas cards are printed in the hundreds of millions. In 2010 the sales of Cards and Gifts amounted to US$15.5 million a bit lower than expected due to the global recession, but still representing an important financial source for the work of the Fund. Don't forget to buy UNICEF cards and gifts for a good cause!!!!! 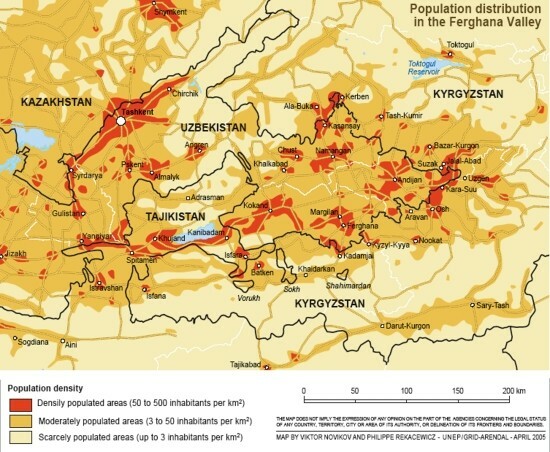 The Ferghana Valley is one of the most densely populated geographical areas of the world. Borders demarcation of the three countries of the Valley, namely Kyrgyzstan, Tajikistan and Uzbekistan was established in Soviet times putting aside any consideration of geographical, economic, ethnic and religious differences of the local population. The new administrative arrangements decided by the Communist Party with the National Policy of 1930, divided the population favoured inter-ethnic hostility. Recently, in 2005 and 2010 the tension resulted in demonstrations and killings. The Institute together with the Alexandria University Faculty of Law will arrange the 5th Annual Conference titled “Access to Justice,” which will take place on December 19-20, 2012 at the Helnan Palestine Hotel in Alexandria, Egypt. Since the United Nations Framework Convention on Climate Change (UNFCCC) entered into force in 1994, the Conference of the Parties (COP) to the UNFCCC has been meeting annually to assess progress in dealing with climate change. Almost 200 governments are parties to the U.N. Framework Convention, which produced the 1997 Kyoto Protocol binding highly industrialized countries to greenhouse gas reductions. The U.N. Climate Change Conference will be held in Doha, Qatar, over the next two weeks. The 18th Conference of the Parties to the U.N. Framework on Climate Change is expected to focus on strategies for accelerating actions to reduce greenhouse gases and to inhibit the increase of global temperatures. Education First is the name of the United Nations Secretary-General’s initiative establish to promote quality, relevant and transformative education for poor children . Globally, more than 61 million children don't have access to school facilities. The initiative aim at boosting efforts to reach the “Education for All” Millennium Development Goal, which aim to fulfil the learning needs of all children, youth and adults by 2015. #EducationFirst: everyone goes to school, everyone learns, & everyone contributes to society. Today, some 71 mln adolescents in low-income countries, are receiving no post-primary education. When we put #EducationFirst, we can reduce poverty & hunger, end wasted potential, & look forward to stronger & better societies for all. The State of World Population 2012: By Choice, Not By Chance: Family Planning, Human Rights and Development will be released globally on 14 November. The report presents evidence of the economic impact of family planning on families, communities and countries. The reports outlines the importance of family planning as an an essential human right. The costs of ignoring the family planning right and the lack of adequate policies affect poverty, exclusion, poor health and gender inequality. The report will be released in Berlin, Geneva, The Hague, London, Madrid, Paris, Rome, Stockholm, Tokyo, Washington, D.C., and more than 100 other capitals worldwide. ILO The International Labour Organization is the UN specialized agency which seeks the promotion of social justice and internationally recognized human and labour rights. It was founded in 1919 and is the only surviving major creation of the Treaty of Versailles which brought the League of Nations into being and it became the first specialized agency of the UN in 1946. The ILO formulates international labour standards in the form of Conventions and Recommendations setting minimum standards of basic labour rights: freedom of association, the right to organize, collective bargaining, abolition of forced labour, equality of opportunity and treatment, and other standards regulating conditions across the entire spectrum of work related issues. It provides technical assistance primarily in the fields of vocational training and vocational rehabilitation; employment policy; labour administration; labour law and industrial relations; working conditions; management development; cooperatives; social security; labour statistics and occupational safety and health. It promotes the development of independent employers' and workers' organizations and provides training and advisory services to those organizations. Within the UN system, the ILO has a unique tripartite structure with workers and employers participating as equal partners with governments in the work of its governing organs. 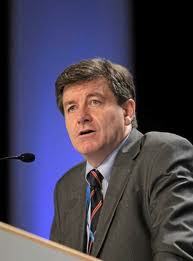 The Organization is currently directed by the new Director-General Guy Ryder who took office in October 2012. Natlex is the database, maintained by the arranged by ILO's International Labour Standards Department, including information on national labour, social security and related human rights legislation. NORMLEX is the new information system which brings together information on International Labour Standards as well as national labour and social security laws. Baku, the capital of Azerbaijan will host from 5th to 9th November the 2012 edition of the Internet Governance Forum. Differently from other UN fora, the participation to the assembly is not restricted to governments' delegations, but also representatives from private sector and NGOs will attend the event. All Main sessions, workshops, Dynamic Coalitions, Open Fora, Side Sessions and Pre-events will have webcast, captioning and remote participation.